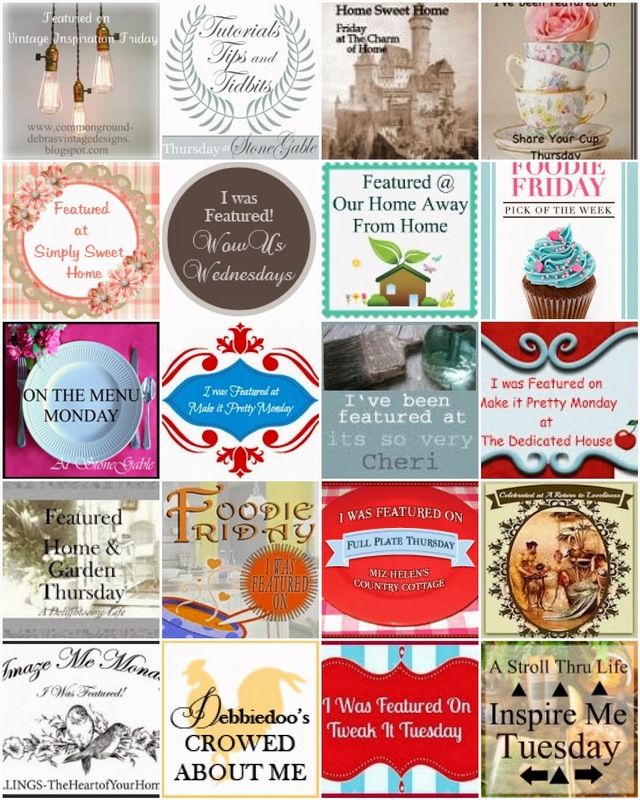 Today I going to the Magazine Copy Cat Challenge over at Debbiedoo's blog. I was inspired by the Better Homes and Gardens October issue. 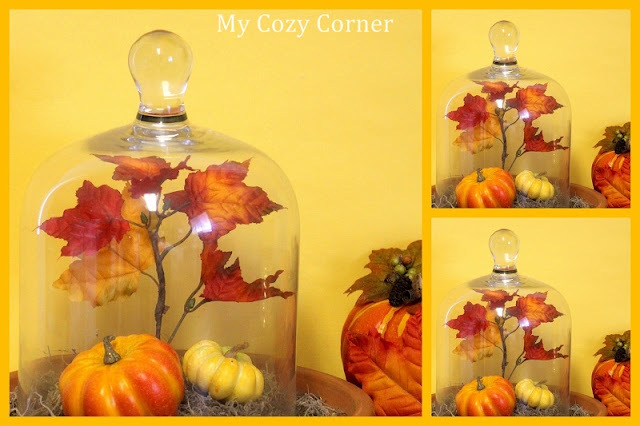 As most of you know I love cloches. I saw this cover and I knew instantly I could do this. I've had the Spanish moss and green moss balls in the foliage bin in my studio . And I was set to design away. Next I went shopping at Michael's craft store. I bought two lemony colored mini pumpkins, two orange colored pumpkins and a sprig of oak leaves. I love the faux vegetables. I can use them next year and maybe even buy more. A few pumpkins and leaves are spilling outside the glass onto the table. Thanks for visiting My Cozy Corner. 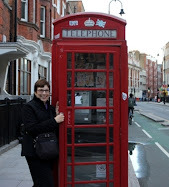 I had a blast putting this post together. I say that every time I finish a post. 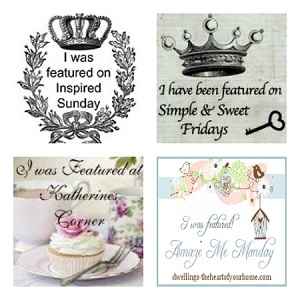 Blogging is a great hobby. It adds so much to my joyous life. Thank you great friends and followers. I adore cloches. Anything you put inside them seems so beautiful and important. I really like your version of the cover. It is a great interpretation. Hi Betty, your Fall cloche is right on! I love it. Isn't it great to be inspired. Gotta love those magazines. Your Fall cloche looks just like the picture! So pretty! You did a great job with this copy cat! Beautiful job Betty. When this came in the mail, I thought drats this one is so cute. Mine was already done though. I was hoping someone else would and here you are. Thanks for sharing and joining in on the fun. 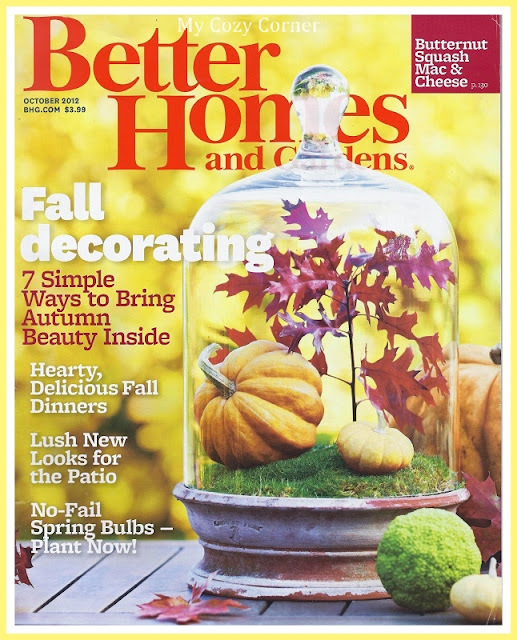 I must admit I am cloche challenged around here *sadly* LOVE your fall cloche, and wasn't that cover stunning!?!??! Great copycat!!! How cute is that!! Great copycat! 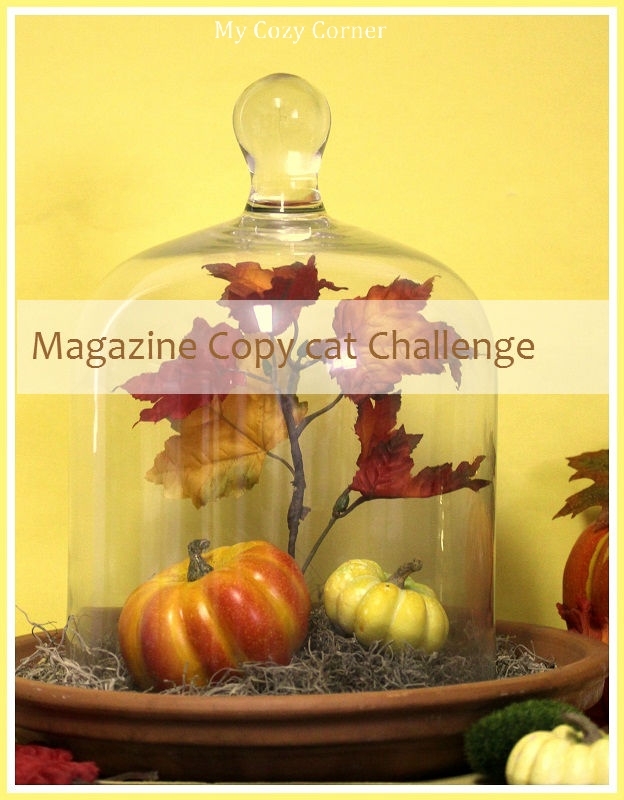 I have a cloche on a stand outside with a pumpkin like this...I felt it needed something and I think the leaves are it!